I’m pretty sure I’ve developed a shin splint. I over did it and now I’m paying for it. 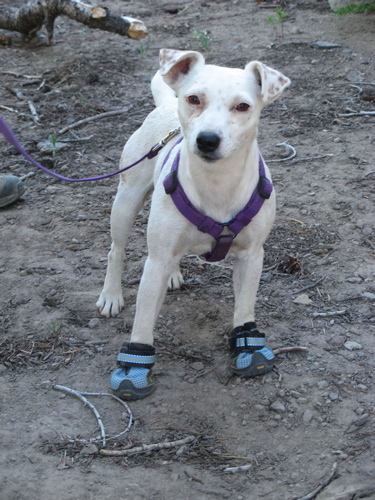 Luckily I’ve met Ryley who is proof that one can recover and carry on hiking. He gave me some ibuprofen (a.k.a. Vitamin I, an anti-inflamatory) and advice as we walked this afternoon. 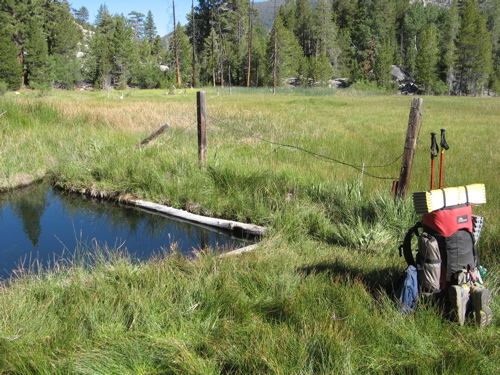 The advice is to have a rest and once I reach Truckee that’s just what I’ll do. It turns out that the pain-killers Dad left me also have ibuprofen in too so they’ll help the inflamation go down and help me ignore the pain in the mean time. But before I discovered all this I was grimacing as I limped along. At first I thought I could use my hiking poles to keep the pressure off my left foot, but I couldn’t develop a sustainable gait. I tried Dr. Bug’s* idea of making an ice pack by wrapping snow in a bandana and applying it to the swelling. It may have worked but I wasn’t making any progress north that way. Then I tried distraction. Food fantasies come easily out here. I thought of lying on the couch at The Green Pub (my old flat in NZ) all weekend, catching up on TV shows and making trips to Burger King, Wendy’s and The Flying Horse. But that just made me hungry so I switched to the iPod instead. Still the foot hurt and still I forced myself to go on, feeling a little glum and generally needing something to lift my spirits. 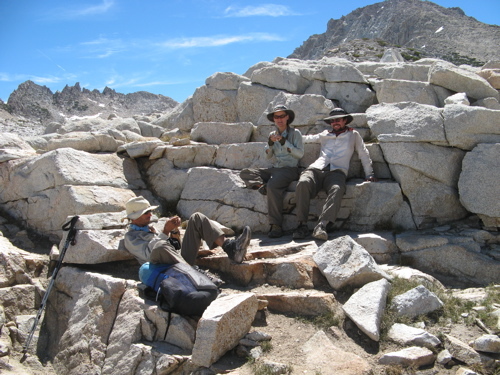 I crossed Ebbet’s Pass and soon met the answer in the form of a couple of lovely day-hikers. 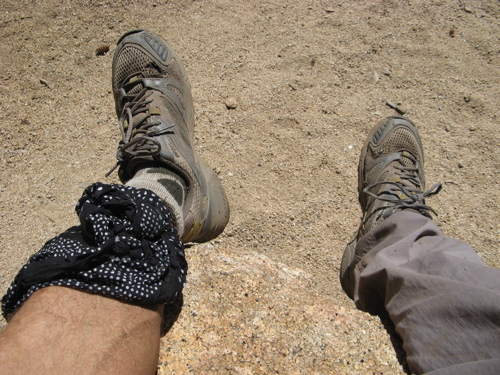 They’ve been reading a few trail journals and knew plenty about the PCT. Immediately they offered fresh fruit and some Clif bars which I ate with delight and perked right up. On hearing I’m from New Zealand they mentioned a book they’d read, Dances With Marmots, and of course they were surprised to hear the author (one George Spearing) worked with my neighbour. Feeling emotionally better I walked on and talked with Heidi, a recent graduate and now doing Sonora Pass to Oregon (700+ miles) with her two dogs. I’m 40% done and still meeting new people. Which is good because trying to catch Blue Sky and Vortex had nearly forced me off trail. Early to bed early to rise, helps my foot heal and get in the miles. I felt like I was sleeping in when I ignored my watch alarm and didn’t get up until 6 when the mosquitoes starting dive bombing me. After yesterday’s undue undulations I feel this morning’s ridge was much more Pacific Cresty. I spent a while being buffeted about by the cold wind and did what I assume to be my last snow crossing. The pourous volcanic rock meant no standing water and thus no little blood suckers. 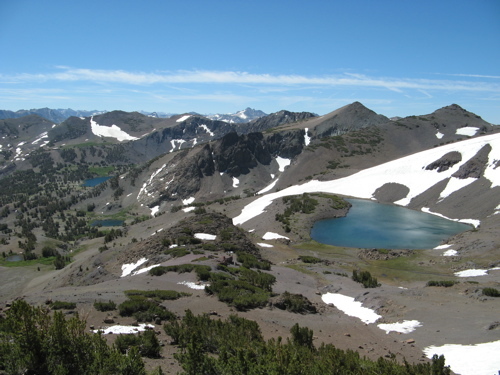 The familiar black rock with lichen motif reminded me of home, but the snow-capped sierras behind let me know where I really was. Sonora Pass was short and sweet. I had secretly hoped for some trail magic, like a box of chocolate or Meadow Ed with a BBQ. But no one was there and I went up to 10,000ft for the last time all alone. The view was nice the air was clean but I wanted to get moving. The afternoon sure did drag out. Plodding down a canyon I began to wonder if boredom could end a hike. I hope not. Some time in here my foot started aching again and if Old Corpus hadn’t said he’d seen Vortex and Blue Sky yesterday I would have given in to the ache a long time ago. As it was I went on. Probably very unwisely and adding more stress to whatever particular tendon is being over-worked. 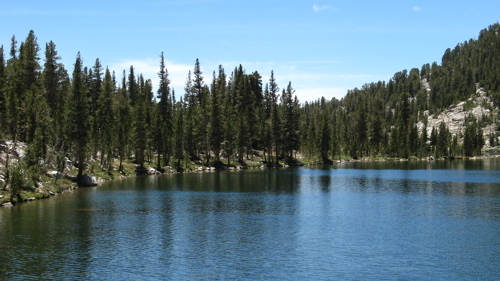 A south-bounder said he saw people matching their descriptions heading for Golden Lake. Well I’m nearly there now but the light faded and I’m too sore to be much more use tonight. The search continues tomorrow, much slower and with a lot more sitting down. Point to point I am 30 miles away and 1100ft higher than last night, but that doesn’t portray the fact that I actually climbed 5,500ft over four big ridges today. But that’s not the number to get excited about. At roughly 6:30pm I charged passed the 1000 mile mark. I would have stopped except I was looking for the footbridge (now apparently just a log) that the databook measures to. 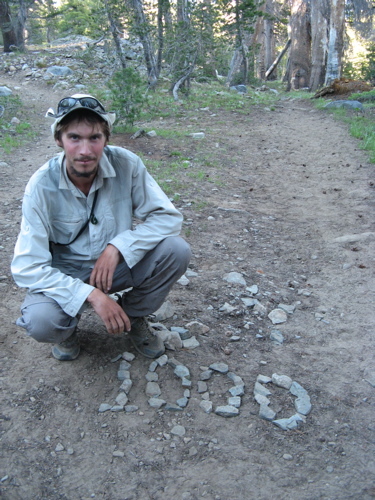 Sweep and Backpacker came along shortly and made a sign with rocks whilst being eaten alive by a million mosquitoes. Enough with the numbers, what does it feel like to walk this far? Well I’m worn out once again, but that’s just from the last two days of overdoing it. I’ll do less tomorrow and feel better. The best feeling today was deciding to stop for a moment and jump in a cold river. I cleaned a few days of grime off, I washed my socks and even drank the water straight (not in that order). I’ll try to make more time for relaxing and fun from now on. My feet are in pretty good shape now so I might consider losing the Vaseline and Badger Balm. I’ve got a new pair of Montrail Continental Divide shoes coming to Truckee. 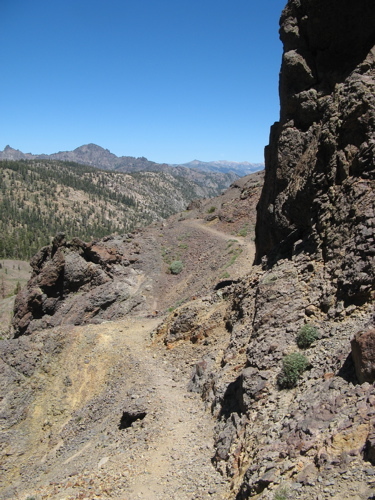 Anyone who hears a salesman saying “your feet will wear out before these shoes will” hasn’t heard of this trail. Being dirty and smelly is part of the territory. I have one day-shirt that I love but it gets grotty quickly. It already looks like the front of a car with all the mosquitoes I’ve squashed on it. I even got a few caught in my air-intake valve today. I don’t think it has been any harder than I expected. We’ve had a pretty easy year with low snow on the passes. Being solo in the woods doesn’t bother me, in fact I had to try really hard to out pace Geezer today because he did that annoying thing of going faster as soon as I passed. I really love just putting my sleeping mat out and getting into my bag. Tentless is the way to go, but I’m not brave/silly enough to be out here without one, so that’s another kilo I must carry just-in-case. I’ve enjoyed the new friends I’ve met. Some are ahead and I’ll see them soon, some are far behind and I may never see them again. I hope a few will visit New Zealand next year. It’s been a very long day, my longest yet, so I’ll probably be brief and try to sleep. I’m now just above Benson Lake over 30 miles from where I started at about 6 this morning. There’s been a lot of undulation and thankfully not many people. p.s. I saw a bear early this morning. It watched me then sauntered away. 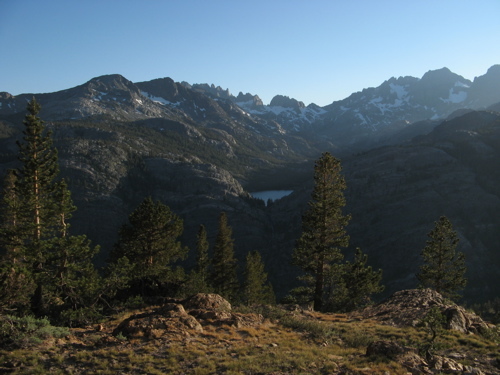 So I’m back at Tuolumne again having crossed Donahue Pass for the second time. I set off early and I set off fast, drinking breakfast as I walked and hardly stopping all day. 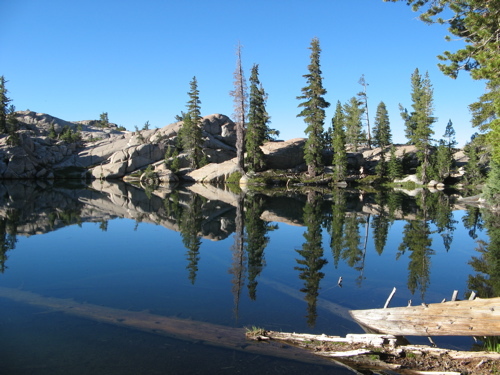 A little after 8am I reached Thousand Island Lake and began the same trail I did with Lucky Joe during my week off. I was there much earlier in the day than last time and the rivers were noticeably lower, especially on the north side of the pass. No huge jumps or wading this time. 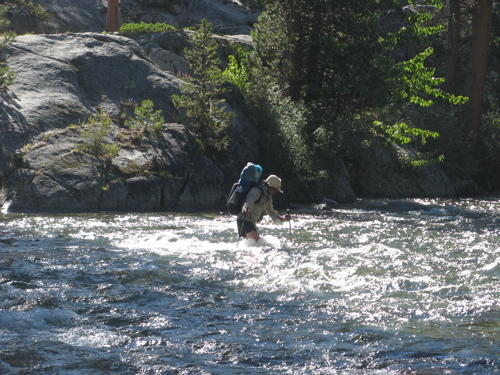 The trail along the Lyell Canyon took a long time, and so much of it with the river so close. It was cool, clear and calling my name but I pushed on to that ranger station and post office afraid I’d have to wait until 9 tomorrow to get my stuff. I made it with hours to spare. I could have swum but by that point I was too beat. I sat and ate and debated leaving again but 24 miles is enough. 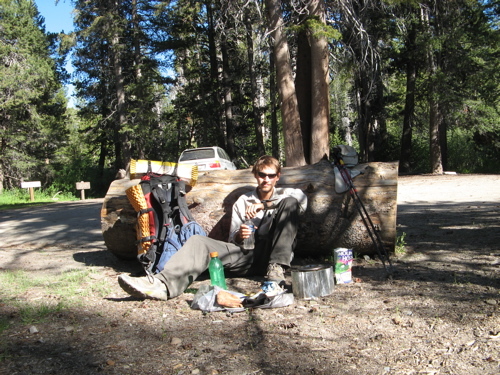 With all the food I have I am now prepared to get right through to Truckee. Hopefully picking up Blue Sky and Vortex along the way. That’s 213 miles in 8 days. Wish me luck. 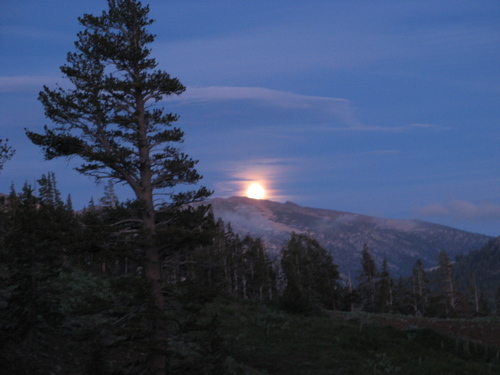 Tonight is my first night alone in the Sierras. I’m without my bear cannister too, I’ll come to that in a moment. I was the first one to stir in the motel room. I got up and snuck out to get to Vons supermarket and do my resupply shopping. At the till a guy saw what I was eating and asked if I was a hiker. He turned out to be Sierra (a.k.a. Randy Gabler) PCT class of ‘77 and ‘84. We talked outside for a while and I got all sorts of advice from him especially not to be down hearted when the scenery doesn’t stay as good as the high Sierras. He’s quite the map fiend and had good ones to show places to hitch to, and not to, from the various road crossings ahead. He drove a bunch of us around, even bought Lucky Joe and I giant ice-creams (where I dropped Joe’s camera and was considerably more worried than when chasing off the bear*). 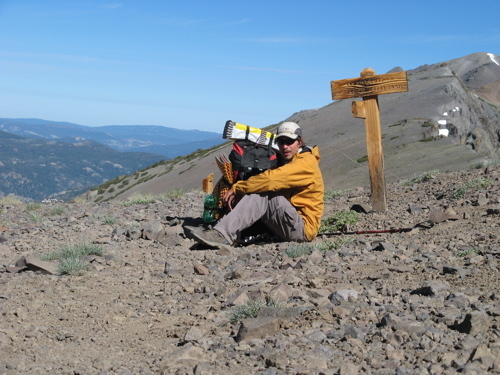 When he left town he took my bear cannister, packed with enough food to get me from Tuolumne to at least Echo Lake, and he’ll stash it at the next ranger station for me. My pack is about 7kgs lighter because of that but it still feels heavy. I walked down to Red’s Meadow from the Horseshoe Lake path through what was once lush green forest. 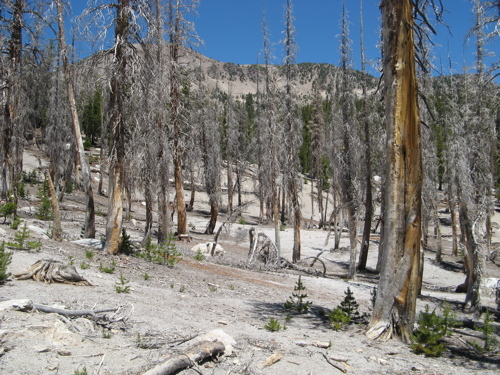 The first part is now suffocated trees, killed by volcanic fumes leaking from some vent near by. The rest is a charred skeleton left by the Rainbow Fire a few years ago. At the store I was met by the front of the herd. Almost 20 PCT hikers came and went during the hour I was there. I didn’t know any of them, or feel much connection to them. As I set off my mind was occupied with schedules and logistics. I was stuck between doing big miles and getting away from The Herd, or slowing down and enjoying it more. Lucky Joe has stayed an extra day to keep in contact with his family, but he’ll catch me soon. Blue Sky and Vortex are probably 50 miles ahead. With 25 mile days I’ll have time for some zeros before reaching Oregon. I needed an iPod to help me tune out of thinking, but I kept it stowed and plugged on. The ridge to Agnew Meadows has been lovely. 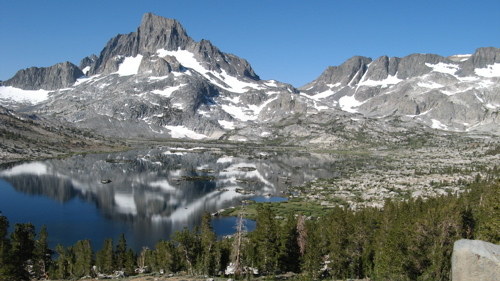 Once up here it is gently rolling, and there are great views across to the undulating JMT path I did 10 days ago above which rise the jagged Minarets still wearing a collar of snow. The sun was setting at one end of the canyon as the moon rose at the other. There is probably something to be said about the light leading me forward and night drawing in on my time in the Sierras, but I’ll leave that to the poets. Now I need to retreat into my bag and smell unlike bear food. * Not because Lucky Joe is scary, he’s great and totally forgave me, but I thought I had totally broken it, so I assumed I’d give him my camera as a replacement and have to go find another one or carry on camera-less, which would would be terrible given how beautiful this trail is. I was up and gone before anyone noticed. With only three bars left to eat I had to get to Red’s Meadow for a proper breakfast, and I did. The walk was easy, all down hill, but very dusty. I saw a black bear about 50m away and when he saw me he ran, like really ran. I could hear his foot steps on the soft ground from that far away and he was a heavy one. I know now I’d have no chance of getting away from one of those. At Red’s I went and claimed my food bag from the bear-proof box near the ranger station then waited around as other hikers drifted in. 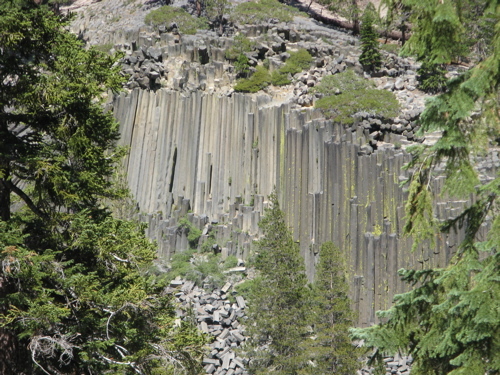 I queued with a crowd of kids from the Youth Conservation Corps (in the valley building a viewing platform for Devils Postpile) to use the free hot-spring showers. They were good and I got mostly clean. Tourist was getting back on the trail after being sick for nearly a week. Along with Mosey the four of us checked in at Motel 6 and set about the usual town duties of food, laundry, resupply, internet and putting one’s feet up. It was as we wandered along main street looking for ice cream that someone spotted Tourist. She looked exhausted. The kind of exhausted when I’m afraid to say much in case it’s the wrong thing and she’d burst into tears. I didn’t and she didn’t, Angelhair took her pack and walked her to the motel where she is now quarantined. She had been traveling with a bunch of others that got really sick, including Neighbor-J who actually got air-lifted off the mountain, and hadn’t made it more than a couple of hours that morning. It’s day 66 and I have passed the 33% mark on the trail. Lucky Joe and I were with Angelhair and Rigatoni (together known as The Noodleheads) and we made a little sign with sticks so others would know how far they have come. And we have come far. I’m sleeping on a hillside 898.8 miles from Campo and I walked all this way by myself. I appreciate all the people that have helped me along the way so far, and I’m looking forward to meeting more later. Crossing Silver Pass was a slog, they all have been, and after that we still had considerable ups and downs today. 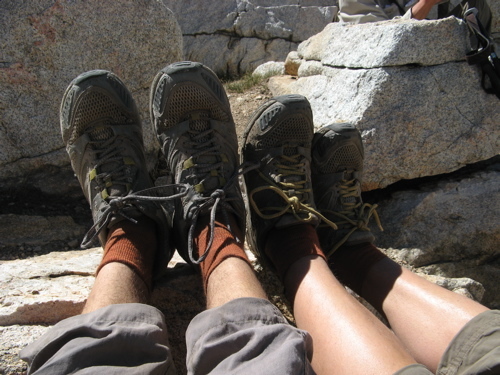 Resting at the top I put my feet up and Angelhair noticed we had the same shoes, and socks, and even spare socks drying on our packs! That deserved a photo. Later at our lunch Rigatoni pulled out one of the most useless, but funniest, items I have seen any thru-hiker carrying. He had a fully laminated menu from Denny’s and got Lucky Joe to read out some of the main courses, especially one that had ground beef sprinkled on chicken. That ain’t right. I’m surprised my feet are holding together, they really don’t look good. 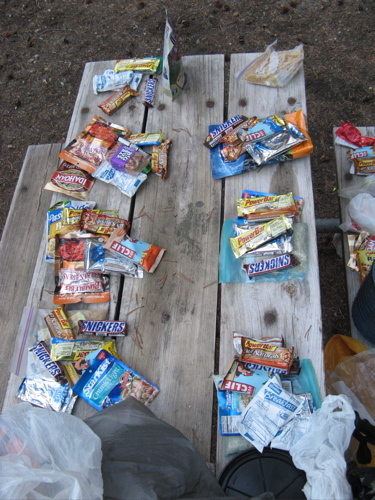 I’m down to just three energy bars for tomorrow’s dash to Red’s Meadow where I hope to find the food I stashed and an open diner for breakfast. I discovered today that Lucky Joe actually gave me his last cookable dinner the other day (we skipped VVR so I was a day short) so only ate cold food tonight. He said he was ok with it because he brought far too many snacks. Good guy. Well it’s cold and dark up here, again without tent but we’ve been down in valleys for a few days, this may affect my ability to make an early start. 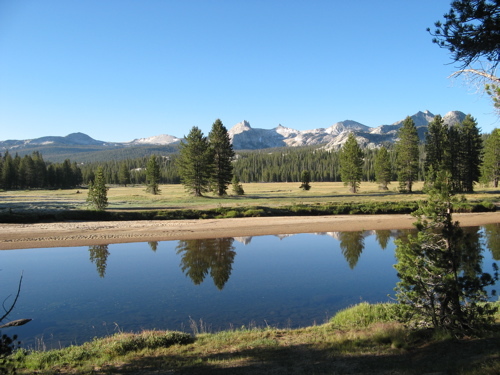 Though I initially doubted the wisdom of adding 4 non-trail miles to my day I did go to visit the Blayney Hot Springs just across the San Joaquin River from the Muir Trail Ranch, and it did wonders for my feet. Fording the river was a simple, but freezing cold affair, then follow the path and the barbed-wire fence out into the middle of a meadow to a hole full of warm water. 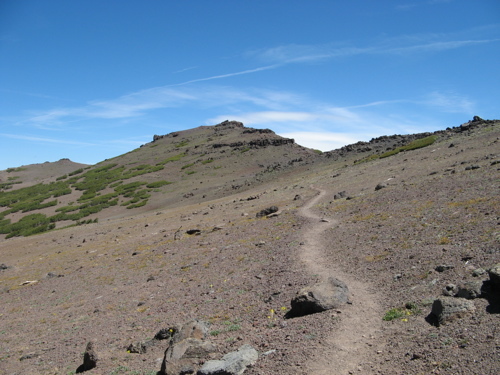 My feet really did feel good so I tackled the big climb of the day, up to Selden Pass, without trouble and arrived in time to see Wounded Face before he hobbled down the north side. Poor guy has to get to VVR for a rest and some foot care. On the way down Lucky Joe and I had to cross the other much-hyped creek of the Sierras, Bear Creek. The water was swift but with my shorts rolled up they hardly got wet. We had more trouble with insects than water. The mosquitoes were swarming like nothing I’ve seen before so it was a rush to put shoes and socks back on before heading to the hills. We actually managed to run short on water today, not an easy task in these stream-laden hills. But there wasn’t one where the data book said so we had to do 3 more miles than we expected and consequently we’ve racked up 28 miles today, a big number for this part of the trail and great for how bad my feet were last night. P.S. I think I spent too long without a shirt yesterday, my shoulders are a little crispy. No fun when you have to lug a backpack all day. Today is the longest day of the year here in the northern hemisphere and boy do my feet feel it. My socks have suddenly started wearing out all over and it means a lot more rubbing on my skin, which hurts. Getting up to Muir Pass was tough. 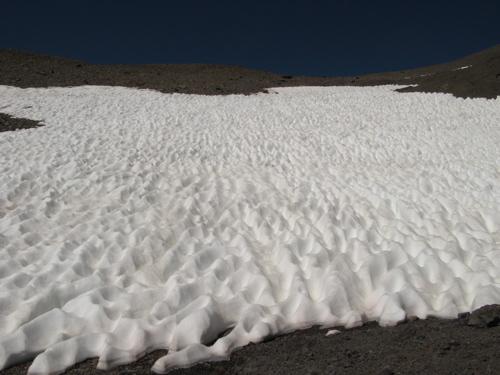 Not that there was any snow worth mentioning, it was just a long way up. 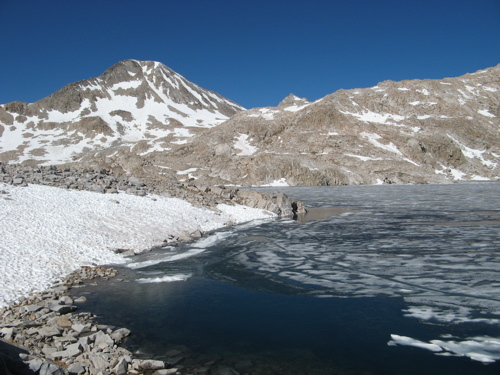 Helen Lake, just before the top, was still mostly frozen. Standing on the rocky edge and looking at my feet it was so clear it was hard to tell where the water started. 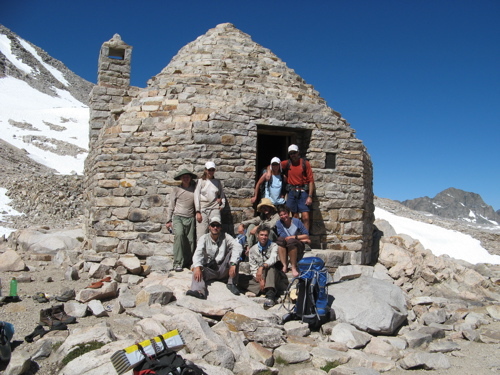 On the way down, when I could see miles of the trail in front of me, and I knew anyone coming from the south would stop at the hut for a while, I was able to partake in the days festivities until stopping for lunch meant I could be surprised at any second. Once again the descent from the pass was what wore me out. 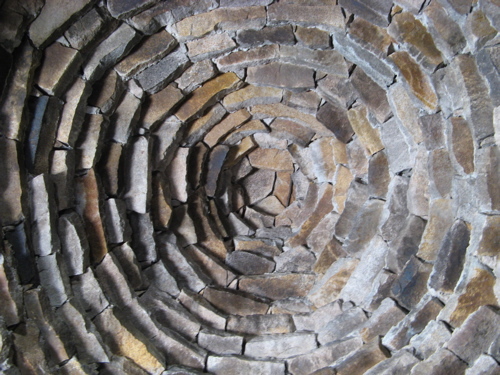 I trundled on past the deep blue Evolution Lake, snapping only a few pictures of its far granite wall. Crossing Evolution Creek was a simple affair. This and Bear Creek are often talked of as the big crossings but with this year’s low snow it hardly even splashed above my knees. Now I’m camped much further down the valley, exhausted and sore, debating whether or not to go to the hot springs tomorrow. They sound great but can I add 4 miles and soaking time to my day? 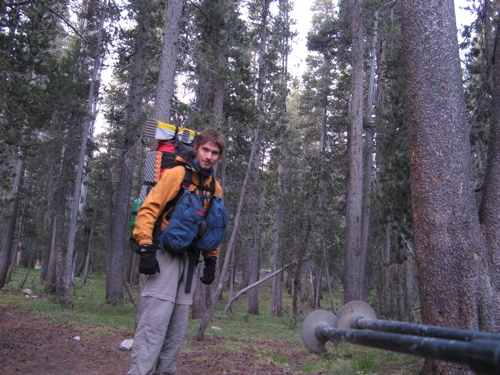 You are currently browsing the PCT2007 weblog archives for June, 2007.